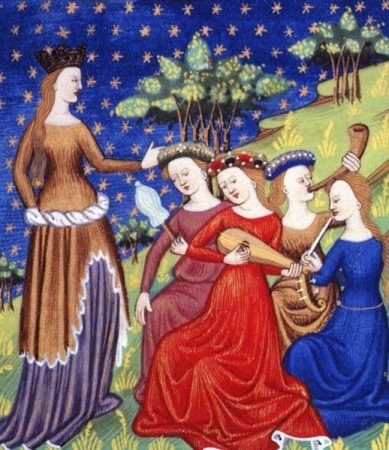 Early folk or traditional music was the music of the common people. It normally was shared by the entire community (from labourer to troubadour to prince) and was further transmitted by oral tradition. During the 20th century, modern folk music was understood to be a particular kind of popular music which was culturally descended from or otherwise influenced by this early or traditional folk music.This newer kind of folk music is most often performed by gifted amateur and professional musicians with play-for-profit performances and recordings. The early egalitarian music common to all became the province of the select few. Today modern folk music is seen as somewhat synonymous with traditional music by the general population. Amongst musicians, however, traditional music refers more to the early egalitarian folk music passed through word of mouth tradition as opposed to the popular commercial "folk" music composed by professionals for professionals as seen today. Queen with four attendant maidens playing traditional instruments. Much of traditional music was originally vocal music, since it did not require an instrument. Traditional music forms are lyrical, and often refer to something tangible. Hymns and religious music retain their traditional and unknown origins. Gregorian chant was originally an oral tradition in monastic communities. Traditional Christmas carols currently preserve religious lore in song form. Work songs with call and response structures enabled the labourers to sing and coordinate work within the rhythms of the songs. Professional sailors used sea shanties for the same purpose. Love poetry, often tragic or remorseful, is prominent in many folk traditions. Nursery rhymes and nonsense verse also originated in the folk tradition. The same music transmitted by word of mouth and from instrument to ear varied from community to community with an active encouragement for creative modification being the norm. This makes it difficult to nominate a single "authentic" version. Folk music seems to reflect a universal impulse and is probably as old as humanity itself starting from the dawn of speech. However, with the development of modern society and the advent of literacy and an all-for-profit culture, a new form of transmission of music was created which eventually eliminated the original oral folk tradition. The decline of traditional folk music in our culture can be seen in three stages. One of the first folk traditions impacted by the advent of the printing press and the aggregation of people in cities was exemplified in Elizabethan times where urban poets wrote broadsheet ballads that were sold widely. The ballads [lyrics] were for tunes that everybody knew from within the folk tradition then current amongst the new urbanites. Later, the traditional melodies were affected too as well as words. The more modern urban melodies were distributed as printed music in the standard major and minor scales whereas more remote rural areas retained the more traditional pentatonic scale. The use of technology and the commodification of music into various media forms allowed for popular music to be born. Around Victorian times, ordinary people were first offered music as a mass commodity where common folk became passive listeners and mass consumers rather than active participants. The Victorian music hall became the forerunner to today's CD. The introduction of popular music coincided with the mass urbanization of the Industrial Revolution. With the migration to the cities and the new urban lifestyle, people were sufficiently disrupted to lose their agrarian social traditions along with their close emotional bonds to their traditional music. As technology advanced, popular music became ever more accessible and desirable. A succession through music halls, broadsheets, recording media like LP's and CDs, radio, television and the Internet have led successive generations to become passive consumers of commercial popular music rather than active and participatory performers within any music form - traditional, community or otherwise. With the advent of global communications and the Internet even remote tribal communities are now being "urbanized" with popular music. All tribal people can and do sing within traditional communities with encouragement starting from an early age. Many play an instrument. This democratizes musical expression, with everyone getting the practice and confidence needed to be able to sing and perform in public. In the absence of traditional music many individuals now do not sing nor play any instrument. This has become the norm in modern first world countries where even singing the national anthem is now left to the professionals. This loss of traditional music is occurring at varying rates in different regions of the world. Naturally, where industrialization and commercialization of culture are most advanced, so tends to be the greatest loss of folk or community music with the substitution of commercial "pop" music for participation. Yet in regions where traditional folk music has become a talisman of cultural or national identity, the loss of traditional folk music can be slowed or reversed. This is seen in Bangladesh, Brittany, Crete, Galicia, Greece, Hungary, India, Ireland, and Turkey where all retain their traditional music to some degree. Many cultures are now actively reclaiming their lost musical traditions and have reversed the decline. The first step to reverse the over-popularisation of popular music is to get more music performed by the ordinary person and not just the professionals. The priority is to make music performance an important part of people's lives - not as passive listeners but rather as being creative musical performers in their own right. Alison Vardy, who is featured on this website, has journeyed through numerous musical traditions from regions and countries including: Brittany, Cape Breton, Chile, Columbia, Cuba, East Africa, Eastern Europe, England, Greece, Ireland, Israel, Paraguay, Quebec, Scotland, Spain (Ladino), The Balkans, The Shetlands, Venezuela, Wales and Zimbabwe. She has been inspired by the rhythms found in multi-cultural traditional and ethnic music - the music of the people. You will hear these influences in her music - her play, her compositions and her rhythms. 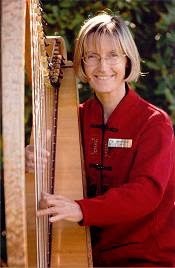 She hopes that you too will find these same influences in her harp compositions accessible in your own play and that you will be inspired to explore various musical traditions further. The future of music is in your hands and not simply in those of the musical professionals. The music offered on Alison's websites will hopefully inspire more play, more harpists and more family or community music. Alison has seen a resurgence of everyday people wishing to play the harp and she desires for this website be an easily accessible resource towards this new direction. Enjoy!